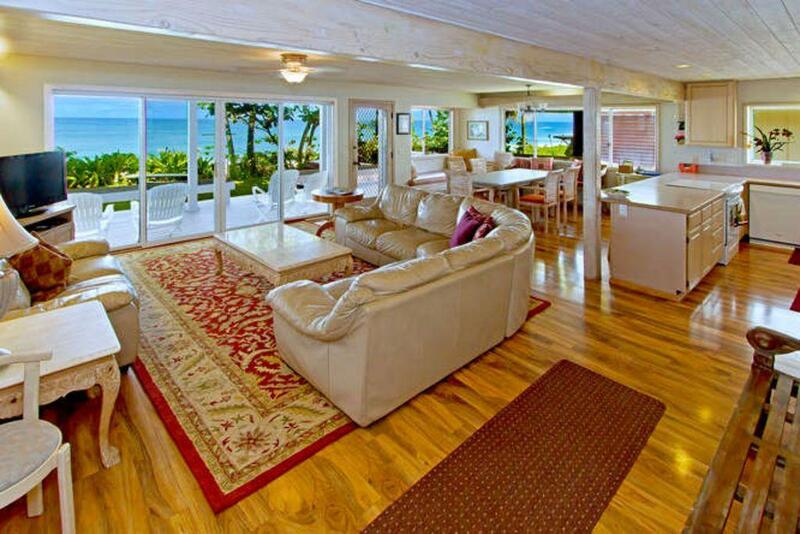 Relax on the decks of this lovely North Shore home and enjoy the breaking waves of ''Rockpiles''. A favored big wave beach destination this home offers you private stairs off the lawn to the white sand beach. With four bedrooms, a family room and large greatroom this home is perfect for family and friends. A short walk will take you to all the action at ''Pipeline'' as well as the farmer's market, and the tree lined bike path runs right past as it snakes its way to Sunset Beach. From big waves to jet skis to biking Pupukea trails this home is central to it all! $675 per night. 50% down to hold a reservation. Balance due 75 days before check-in. $500.00 security deposit. $300.00 cleaning fee. 4% processing fee. Listed rates do not include tax. Holiday and peak season rates and required length of stay may be different than quoted above. Credit cards, cash, checks and wire transfers accepted. Minimum night stay varies amongst the various rental units. Many rentals have 30-night minimums. Tax number: TA-001-679-7696-01. Great location. Nice, clean house. Well equipped with everything we needed. Awesome location!! Couldn't ask for a better place, it was perfect for our family. No hassles, everything went fine, we were very happy with the house overall. The North Shore is the best place to just get away and "hang". Thanks and we will be back!! We had a wonderful time and the accomodations were great... The view was beautiful. Thank you. The location was fantastic, superb views, absolutely unbelievable. My family had a great holiday. We loved the house at North Shore. It was a very rainy time while we were there, but we even enjoyed swimming in the ocean in the rain. It is a great location, especially if you love big waves. This was the best vacation ever! The house was beautiful and welcoming, a lovely bit of paradise that the whpole family could share (we ranged in age from 5 years to 60 years). The children would have beeen happy to just stay on the beach. Mahalo from all of us. We had a wonderful time and hope to return with the rest of our family in the future. The house was fantastic! Had everything we needed plus a great location. Thanks you!